My doctor friend is a full-time emergency room doctor in a well-respected trauma center. He was entering into two weeks of police training, more specifically Basic Special Weapons and Tactics (SWAT) School. The doctor decided to pursue a volunteer position on a local SWAT team's Tactical Emergency Medical Support (TEMS) unit. But this was not an abbreviated familiarization course tailored for doctors, nurses, or paramedics to become "tactical medics." This two-week school was to prepare veteran police officers for an assignment as full-blown SWAT team officers. This course is no joke. Given that he had NO prior law enforcement experience, that his only firearms training was of the self-taught variety, and that the rest of the 20+ students were experienced street cops and detectives, I didn't have very high expectations of him. Upon the conclusion of the school, I talked to the course instructors. They remembered him vividly. Uh oh...was he THAT terrible? Quite the opposite. He excelled, labeled by the training staff as the top performer in the whole school. The most solid tactical thinker among experienced crime fighters. This sparked a conversation...and I had an epiphany about police culture and officer training. SWAT medic units bring together two similarly-programmed cultures. Process and Systems thinking. Good "processes" influence good outcomes. Understanding a "system" means comprehending and anticipating or diagnosing the cause-effect of interrelated parts. A defensible and effective process works through the system at hand. This is not a step-by-step method like tying one's shoelaces. It's more like diagnosing a fixing a broken car engine through looking at the How and Why it functions. Problem "triage" and prioritization. Multiple problems have to be prioritized. Sometimes it's beneficial to knock out those simple obstacles that require little effort first and then move onto the more complex situations. Sometimes it's absolutely necessary to attack those problems with the most potential for damage. Professionals learn how to triage these problems according to required effort, timeliness, importance, and seriousness for maximal effectiveness. Balance of a decision's accuracy and timeliness. Some decisions require absolute correctness (like an untamed math test). Others need immediate intervention, even if not precise (like an artillery strike). In climates with 20/20 hindsight and an unlimited time to scrutinize, it's easy to fault decisions that aren't perfect. But in crises, we need a balance between accuracy and time. Sometimes we need to not only accept, but embrace, a reasonable option implemented NOW. By the time one calculates the immaculate answer, it may be too late. Implementing "stabilizing" strategies. To stabilize means to hold or suspend. In crises, this equates to immediately address those urgent problems that have are having (or will soon have) negative impact. One cannot imagine bailing out water from a sinking ship until one first plugs the hole. Only after the leak is stopped can one slow down, assemble the proper resources, and move onto the less-pressing issue. With emergency or exigent problems, we need decisive action...but only until that urgency or exigency subsides. Then slow down. Stabilize. And make a new plan. Benefits of being a "Generalist." In situations when the future is sketchy, it is better to be a Generalist rather than Specialist. Generalists spread their knowledge wide instead of deep; Specialists pool of expertise runs deep, but narrow in focus. When the future can bring any sort of problem, it is often better to have a broad understanding, like the jack-of-all-trades. 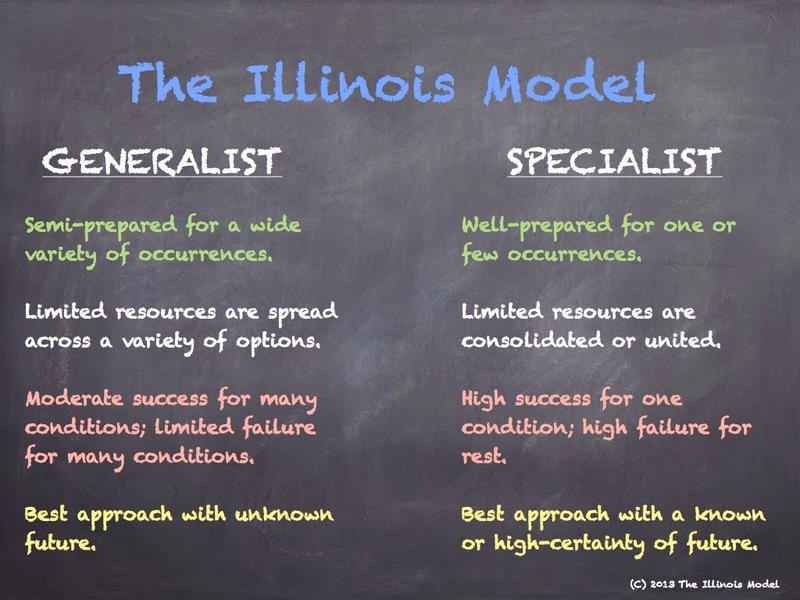 Generalists collect information, analyze the chaos, take necessary precautions, and stabilize a situation long enough for a Specialist to step in. The key is in understanding and having the familiarity to know which Specialist to call in. When I look at the above list of so-called "soft" skills, I question What's so soft about them? These are identifiable aspects of a problem-solving culture...whether in a hospital emergency department or a police officer responding to an unknown disturbance. These are describable and articulable skills, attitudes, and abilities. But because of their lack of technical-complexity or application, society calls them "soft." Whatever we call them, we have to find ways to nurture and cultivate them in our police officers. We have to change the culture of our people from technicians to problem-solvers. The same goes for soldiers, and firefighters, and emergency managers, and nuclear power plant operators, and pilots. But then why stop there? Why aren't these traits being specifically named, taught, and evaluated in grade school? or college? or in trade schools? I don't know enough about medical doctor education to know whether or not these traits are being addressed or not. I'd venture they are not. But I intimately know police training, from basic police academy curriculum to advanced legal, strategic, and tactical courses. These concepts are barely mentioned. They exist, but we don't educate, train, or evaluate based on them. However, there is a pocket movement that lumps these ideas into the term "adaptive leadership" and tweaks it for law enforcement. These are steps in the right direction. I'm excited to hold even my small stake in the advancement. Louis Hayes is a co-developer of The Illinois Model™ law enforcement operations system (LEOpSys) and moderates several courses rooted in its theory and concepts. He is a 16-year police officer, currently assigned to a multi-agency tactical unit in Chicagoland. He is detailed to his team's medical shop, where he learns a very narrow skillset of penetrating, blunt, and blast trauma treatment. 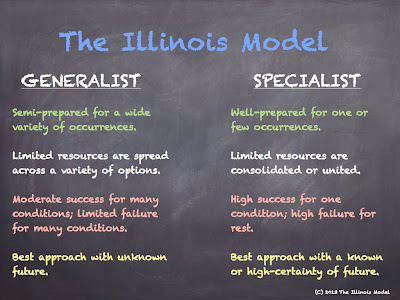 The above ideas form a solid framework of The Illinois Model and are used as main theme for changing police culture. A full compilation of articles on the model can be found here.